By Paul Perry, Raymond Moody, M.D. & Jeffery Long, M.D. What happens when we die? 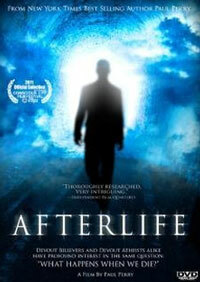 This and other important questions are explored in Afterlife a revealing documentary that stars noted researchers Raymond Moody, MD, PhD, and Jeffrey Long, MD, and features emotionally-charged interviews with people who have crossed the threshold of death and returned to tell their stories. This film confirms what scientists have discovered since the 1970s, when this field of near-death studies began: that NDEs prove a life after life.